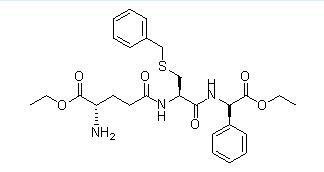 Remarks: Ezatiostat is a liposomal small-molecule glutathione analog inhibitor of glutathione S-transferase (GST) P1-1 with hematopoiesis-stimulating activity. After intracellular de-esterification, the active form of ezatiostat binds to and inhibits GST P1-1, thereby restoring Jun kinase and MAPK pathway activities and promoting MAPK-mediated cellular proliferation and differentiation pathways. This agent promotes the proliferation and maturation of hematopoietic precursor cells, granulocytes, monocytes, erythrocytes and platelets. Check for active clinical trials or closed clinical trials using this agent.